Two-time world championship medalist Lea Davison vies for third Olympic berth with support from women's team Sho-Air Twenty20. Mountain biker Lea Davison wants another shot at the Olympics, and she hopes a change of teams helps her get there. Under her deal with Sho-Air Twenty20, Davison will compete at domestic races alongside current under-23 cross-country champion Savilia Blunk. On the World Cup, Davison will be supported by USA Cycling’s national team. A multiple-time U.S. national champion, Davison qualified for the U.S. Olympic team in 2012 and 2016. She also won bronze at the 2014 UCI mountain bike world championships, and silver at the 2016 worlds. Davison says she struggled during the 2017 season after her former team, Specialized, let her go. Davison said she also was challenged by early-season illnesses over the past two seasons; in both cases, the sickness derailed her during the early part of the season. With Clif Bar shifting its focus away from the UCI World Cup series for 2019 Davison had to find a different way to fund her Olympic chase. The U.S. Olympic team is often chosen based on results on the World Cup circuit. Davison is one of multiple talented American female cross-country racers hoping to qualify for the U.S. Olympic squad in 2020. Kate Courtney (Scott-SRAM) is the defending world champion; Erin Huck (CZ Racing) and Chloe Woodroff (Stan’s-Pivot) are both riders with major international results. 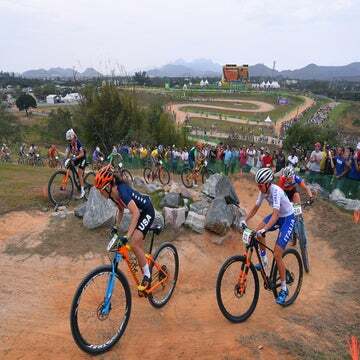 The UCI awards three Olympic spots to the top countries in international mountain biking. Davison believes the U.S. can secure at least two spots. Davison has yet to decide a starting date for her 2019 campaign. She may kick it off with the U.S. Cup round in San Dimas, California, or with a UCI MTB Cup race in Puerto Rico.